Отправь заявку сейчас и получи скидку 50%! Получи скидку на космический интерьер! Спасибо! На вашу почту отправлена демо-версия нашей программы. Если письмо долго не приходит, проверьте папку "Спам". Designed for general PC users. Providing technical support, telephone and TeamViewer lessons, video tutorial. В комплекте идет набор из ?? космических анимаций. Use the mouse to select the area that projection needs to consider: pictures, furniture, ledges, arcs, any part of the wall. We add new animations to the library on average every 2 months. You always have fresh content to make a projection. 1) Use the mouse to select certain objects on the wall: pictures, furniture, doors, windows, other interior items. 2) Generate the playlist and adjust the effects. 3) Add your own videos, pictures, inscriptions (optionally). Setup process usually takes up to 5-15 minutes. For an advanced user, it is only 1-5 minutes. Settings can be saved to a file. You can run the program in background and work with other programs while POGUMAX Designer will be displayed through the projector. Along with the software comes User manual, which includes video lesson. Besides, if necessary, we provide training and technical support via phone or remote access program TeamViewer. Training is easy for everyone. With appropriate graphics card, one computer can display images to multiple projectors. Projectors can show same or different pictures, or single panoramic projection. POGUMAX Designer Software license cost depends on how many projectors will be used. Add your videos, photos and text into projection. Single projector support. With multiple projectors, price is different. Contact us for multi-projector license. You will get an email with instructions to download the software. 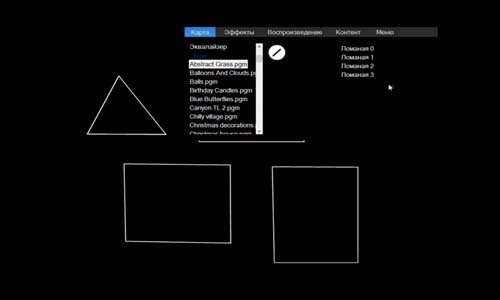 POGUMAX — Russian company that developed software for video projection interior design. In 30 minutes you can create magic in your room with over 800 video effects. More videos in video gallery.